Heterocyclic chemistry is the biggest branch of chemistry covering two-third of the chemical literature. The series covers hot topics of frontier research summarized by reputed scientists in the field. Our review series is topic related. Mechanistic Investigations of Copper(I)- Catalyzed AlkyneAzide Cycloaddition Reactions. Click-Triazole Coordination Chemistry: Exploiting 1,4-Disubstituted-1,2,3-Triazoles as Ligands. Binding Anions in Rigid and Reconfigurable Triazole Receptors. Click Triazoles as Chemosensors. Triazole-Based Polymer Gels. 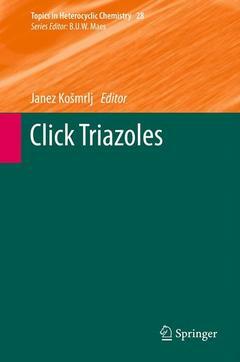 Click Triazoles for Bioconjugation. Recent Developments in the Synthesis 1,4,5-Trisubstituted Triazoles.